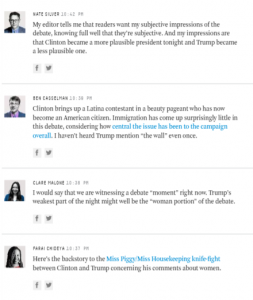 It took a team of about 30 NPR reporters and editors to annotate live transcripts of the 2016 presidential debates, according to Amita Kelly, a reporter on NPR’s politics team. 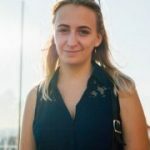 The roster included journalists from politics, business and international security, with editors simultaneously working to clean up the transcript itself as well as the fact checks and analysis. 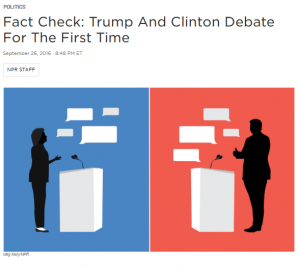 NPR’s fact check featured an unfolding live transcript of the debate, with various claims underlined and linked to fact checks from NPR staff. The annotated transcript of the first debate drew more than 2 million views within 48 hours. 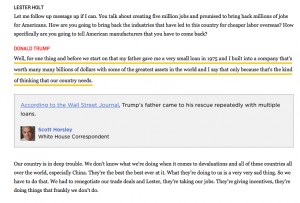 An example of a fact check from NPR during the first debate. Because many of the claims the candidates made during the debate had already surfaced at some point in the campaign, the NPR team was able to rely on previous reporting to quickly verify information, according to NPR digital team member David Eads. While the speed of the instant fact check may not always be possible, Graves said NPR’s fact-checking endeavor illustrates a conversational style that is trending in today’s journalism. FiveThirtyEight live-blogged the first presidential debate. Pointing to FiveThirtyEight’s election team, which takes a Slack conversation between reporters or experts on a designated topic, edits it for clarity and then posts it directly to the web, Eads said news consumers are looking for more of a dialogue than traditional journalism has offered. “It seems that people want to hear a lot of voices, sort of in dialogue, and not this omniscient detached narrator that can provide journalism from the the 50s,” Eads said. “When Clinton, something comes up about her emails or a tax plan or a tax credit, I want someone to poke me and say ‘Hey! Actually, she’s been saying this all along, or this is different than what she said, or that’s actually not what those experts agree with,” Kelly said. Eads noted that this particular style of journalism has the potential to fill in gaps left by social media. Graves said he hopes the way this election cycle has shaped fact-checking continues. Even in regular news pieces unrelated to the election, Graves said he’s starting to notice reporters make fact checks more freely. In the past, he said, journalists would refrain from challenging a source within a straight news report out of a fear of being accused of bias. As for NPR’s live fact check, he applauded the effort but hopes to see more fact-checking integrated into the debates themselves, either through moderators or video clips. Cadence Bambenek is a fellow for the Center for Journalism Ethics. She is a student in the School of Journalism and Mass Communication at the University of Wisconsin-Madison.